Even as I watched a live stream of Mark Zuckerberg announcing major changes to Facebook this week, my focus drifted to LinkedIn. 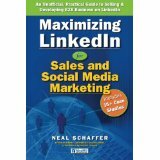 An excellent book, Neal Schaffer’s Maximizing LinkedIn for Sales and Social Media Marketing, had pushed LinkedIn back into the front of my social media marketing mind. The 207-page gem offers many practical, easy-to-understand strategies and tactics for utilizing LinkedIn to achieve career and business objectives. It includes more than 15 case studies to help readers see how others have used LinkedIn to their competitive advantage. Almost two years ago, I reviewed Schaffer’s 362-page Windmill Networking: Understanding, Leveraging & Maximizing LinkedIn on this blog. That book made a tremendous difference in how I used LinkedIn to achieve professional goals. For example, I joined the maximum 50 groups and began interacting in many of them. I started viewing my LinkedIn profile as an interactive website where I could share content such as my reading list (through the Amazon plug-in) and PowerPoint presentations (via the Slideshare widgit). I took extra steps to make a LinkedIn group I managed more valuable to its members. Schaffer’s latest book comes at an extremely important time — aren’t they all vital? — in my journey as a public relations professional with social media experience. I entered health care in January after 17 years in government PR and two years in corporate communications with a software company. I really wanted to network with leaders in health care, especially those among the forefront in PR and social media marketing. And, a major part of my job involves using social media to help my employer achieve strategic objectives, including enhancing its much-deserved reputation as a national leader in providing affordable, accessible, quality health care. Immediately, after reading Schaffer’s suggestions, I set to upgrade the Catholic Health Partners company page. For example, I added descriptions and links to services provided by the system, incorporated updates from our @CHPUpdate Twitter feed, and worked with our web developer to put a link to the page on our website. I set up a meeting with our HR folks to show them tools for recruiting talent. Within a week, the page had added more than 100 followers! Also, I re-incorporated LinkedIn into my daily social media monitoring and interacting. I had been checking it sporadically and interacting with groups only monthly. The number of connections shot up by 200 in just two weeks! Thanks to Schaffer’s fine work, I discovered a number of helpful tools such as LinkedIn Signal. They have helped me engage with connections and groups as never before.I don’t want to spoil your reading enjoyment by sharing much more in this post. I encourage you to pick up a copy. You won’t regret it. It’s even better than his first work. Sorry Mr. Zuckerberg, your presentation this week was great — and I’m geekin’ about the coming changes in Facebook –but I’m more excited about the enhancements with LinkedIn as discovered by reading Schaffer’s book. 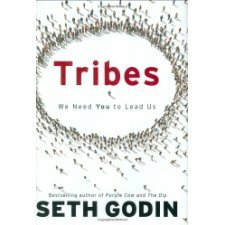 Tribes: We Need You to Lead Us by Seth Godin. This was by far my favorite of the summer. Very inspirational. A look at leadership — how we all can lead important communities in our lives. Godin does an excellent job of telling how times have changed, and technology empowers us to make a positive difference. A must read. Started reading this one at a book store and couldn’t put it down. Program or Be Programmed: Ten Commands for a Digital Age by Douglas Rushkoff. Fascinating book that really makes you think about the difference that technology is making in our lives. Pulled me out of my daily grind and got me to ponder the bigger picture. I’m looking forward to going back through this book with a study guide that a friend shared with me. The Now Revolution: 7 Shifts to Make Your Business Faster, Smarter, and More Social by Jay Baer and Amber Naslund. Stay tuned for more on this one. Picked this up when Jay Baer was scheduled to speak at Cincinnati Social Media in late August. Event was postponed until October, so I’ve pushed up other reading. This looks like a very good one, though. Hope you find these books helpful, too. What have you been reading? Please comment below.